I realized a couple of months ago just how much of my family’s life was now digital. Family pictures, family videos. They were all stored on our computer’s hard drives. If something happened to those and we ended up losing that data, my wife would absolutely kill me. So, inspired by Scott Hanselman, I started working on a family data backup plan. There are four computers in our house: My wife’s laptop (Vista Home Premium), my desktop (Vista Ultimate), my MacBook (Leopard), and the HTPC (Windows XP Media Center Edition 2005). One of the goals of the HTPC was to host zero day there. So there is no data on that machine that needs backing up. So, the first step is to get all data needing backup to a single machine. My desktop seemed to be the best choice. First I broke everything down into five backup sets: Pictures, Videos, Music, Jenny’s Documents, and Matt’s Documents. All machines will share the same folders for pictures, videos, and music since we share those. The next thing to to determine who will own the data. For Pictures, I have it set up where they can be created on any machine and then synced among all machines. For Videos, I don’t want to have all of the family movies on my MacBook, so I set it up to backup all videos to the desktop, but not to copy them all out to the other machines. If I want a set of videos somewhere else it’s easy enough to copy from the desktop. Music is the same as Videos. For documents, Jenny’s documents are copied from her laptop back to the desktop, but not the other way. My documents are copied from the MacBook back to the desktop. I use to use Foldershare for syncing files across machines. However, the fact that it synchronizes deletes scared me. Accidentally delete a file on one machine and all of your copies are deleted. So, I gave up on Foldershare. SyncBack was the application I ended up going with for the Windows machines, and it works great. For $30 you are licensed to run it on 5 machines. More than enough. It gives you the ability to sync some folders, and just backup others. SyncBack runs nightly on my wife’s laptop to copy her documents, pictures, and videos back to the desktop and to copy any new pictures from the desktop out to her laptop. ChronoSync is for the Mac, and works pretty much the same way as SyncBack. Also $30. I’m not quite as happy with the interface as I was with SyncBack, but it does the trick. ChronoSync runs nightly on the MacBook to copy any new documents, pictures, videos, and music back to the desktop. New pictures on the desktop are also copied back to the MacBook. A 300GB Western Digital MyBook is the next step. Every night SyncBack runs on the desktop to copy all five backup sets to the MyBook. If this was all I did, a house fire could still wipe out all of our data. Mozy is the last step. For $50 a year you get unlimited off site storage. 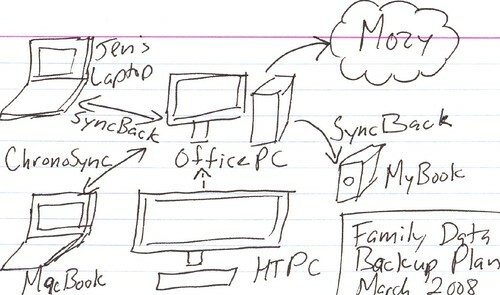 An application runs on the desktop to monitor the five backup sets and back them up to Mozy every night. That’s it. That’s the family data backup plan that I have come up with. Finally I don’t feel nervous about losing any of our family pictures or videos. How digital has your life become? Do you have a backup plan that would prevent losing all of that data?